I am aghast on a daily basis of all of the classic movies my fellow teen librarian has failed to watch. I have, on more than one occasion, strongly encouraged her to view a variety of titles that I deem required watching. Well this week she gave me a dose of my own medicine. 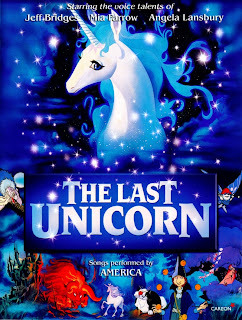 According to Miss Becky, it was unacceptable that I had yet to watch the 1982 classic The Last Unicorn. 1) No one told me that The Last Unicorn came from the same studio as The Hobbit...or the Ellis family Christmas favorite Rudolph the Red-Nosed Reindeer. Awesome. 3) The heavy hitter cast is pretty darn awesome, especially Brother Theodore as Ruhk (also the voice of Gollum which, in my humble opinion, is on equal footing with Mr. Serkis.) I barely recognized Alan Arkin and Jeff Bridges! There voices have become so famous in their older age that without some of the same gruff intonations it was hard to pick them out! 5) And my favorite moment, at the very end, "Schmendrick the Magician: She will remember your heart when men are fairy tales in books written by rabbits." What in the world does that mean? Why are rabbits writing books? Where are this fantastically talented rabbits? Now I know that it means that she will remember him forever, but why bring rabbits into it? I love. Genius. Awesomely genius. So props to Miss Becky for introducing me to this classic animated gem. I can add it to my list of why the 80s were so wonderful along with The Princess Bride, Sixteen Candles, and Pat Benatar. I love how there is still awesome out there for me to discover! Do you have a favorite 80s animated classic?